Cats Protection Sheppy Branch, needs some help with website & Catchat page? 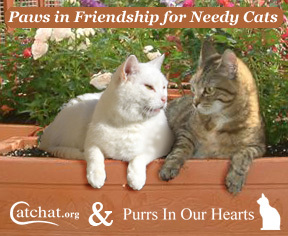 Re: Cats Protection Sheppy Branch, needs some help with website & Catchat page? I've emailed Ron at Lost Cats Brighton and offered my services. I can do press releases and whatever he needs in that way. I'll see what he says he needs. Cat Chat has volunteers that update the Cat Chat pages for rescues if they cant do it and all they need to do is contact one of the Cat Chat staff. Ron can always do with some help. He did have someone helping but as far as I know, he is doing it himself now. I'm sure he could do with other help as he is always so busy. I'm based in Brighton and would be happy to help wherever needed. If it is a template system I would be fine with it. I'm happy for you to see if any other small branches need a hand. Doesn't really need to be near Brighton really as we can do stuff on the phone and web anyway. I have my own business so can take calls during working hours if needed. THough I would do the work at home. Hi all I have had someone in Manchester respond to the post on Catchat and we are now moving forward thanks. Tiga there are alot of smaller CP branches that would benefit from any kind of web presence on Catchat and its dead easy to do..
Where abouts are you? As it would be nice (if you were willing) to see if anyone branch could benefit from your kind offer? How IT literate do you need to be to update a Cat Chat page? I'm in PR and marketing so would be happy to write ads, stories and stuff but don't know how to do coding and things. I have people at work who could help in a bind but not doing the IT stuff for me all the time. If it is simple to update and maintain the pages I would be happy to do it. Is there anyone on Purrs who may be able to lend a hand with website stuff and maybe the updating up and maintenance of a Catchat page for CP Sheppy? I am asking as this poor branch is suffering alot from lack of volunteers and must be missing out alot on rehoming as no website presence.. Because they are on an island they also suffer from vets charging huge prices for veterinary work and are thus suffering from lack of funds and no rehoming. They have asked me to put a plea out for them. None are particularly IT people but are very dedicated in what they do.